This seat is finished in a Rustic Leatherette and Piping for a vintage feel which can instantly finish the look of any re-build or custom bike. 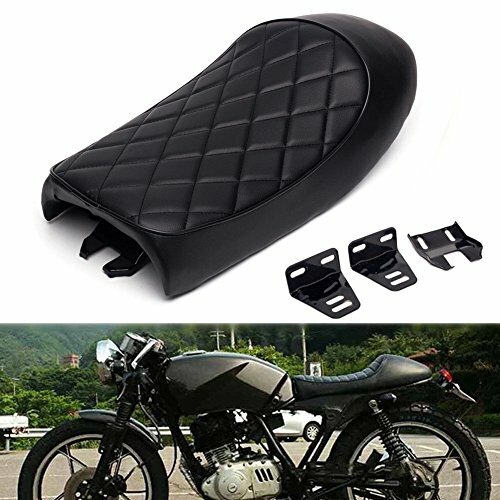 The seat is suitable for all-weather condition as it’s covered with high-quality leatherette, durable, water-proof, yet soft and comfy leatherette. The thick cushion guarantees an easy and comfortable cruise. It’s the Perfect, Comfortable, & Stylish seat for less than half of the price of a custom made seat! This is a universal seat. Modification to the motorcycle frame may be required to mount the seat. Check photos and dimensions before ordering. Some seats may have thin silver colored lines used for stitching. These lines easily wash off with warm water and soap. Thank you. Durable, waterproof, high quality and soft leatherette. Dimensions: 20.9 inches * 9.8 inches * 4.7 inches (L 53 cm * W 24.8 cm * H 12 cm). Durable, waterproof and flexible PU leather of high quality. Vintage Cafe Racer Motorcycle Seat.